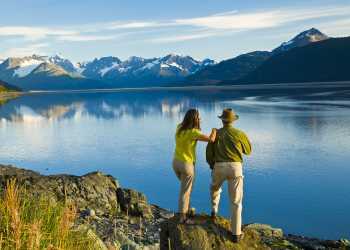 The untamed natural beauty surrounding Anchorage lures sightseers out of their vehicles and into the wild. North and southbound adventures make perfect day trips for Anchorage visitors. Rent a car and take your time; there is a lot to see and do along these self-drive sightseeing journeys. Head north from downtown Anchorage along the Glenn Highway, a National Scenic Byway. Stop at Thunderbird Falls for a scenic 1-mile hike to the waterfall. Continue north to Eklutna Lake. The long, glacial lake is a great place to picnic, pedal, paddle, or all three! Bike and kayak rentals, as well as guided ATV tours are available and start near the day-use parking area. Cross the highway to Eklutna Historical Park. Learn about the blending Dena&apos;ina Athabascan culture and Russian Orthodox traditions, and walk among the colorful spirit houses in the cemetery. See an old log Russian Orthodox Church, which is among the oldest buildings in Alaska. Beginning in Anchorage, the trip along Turnagain Arm is one of the most beautiful highways in Alaska and the nation. Stop by Potter Marsh in south Anchorage and follow the boardwalk through wetland habitat. Hop back in the car, but don’t get too comfy. Pull over at Windy Point to look for Dall sheep and Beluga Point for bald eagles and beluga whales. Further south Indian Valley Mine offers an introduction to Alaska’s gold rush history and hands-on gold panning. Detour to Girdwood for lunch. Grab a sandwich on fresh-baked bread, some sushi, or a burger on a heap of crispy fries. After a bite to eat in Girdwood, hit the Winner Creek Trail. The trailhead is near the aerial tram station behind Alyeska Resort. Out and back is about five miles on a relatively flat trail. Two bridges cross Winner Creek, plus there is a unique hand-powered tram that carries passengers, one or two at a time, across the glacial-fed, roaring waters of Winner Creek Gorge. You can also get a literal overview of the area with a quick ride on the Alyeska Tramway when you return to the trailhead. Back on the highway, continue south to Portage Glacier for a hour cruise to get up close to the face of an icy-blue glacier. Step into the Begich, Boggs Visitor Center to learn about the valley&apos;s dynamic glacial and geological history. The Alaska Wildlife Conservation Center, a wildlife center and park, is nearby. You won’t get better wildlife photos anywhere else. Return to Anchorage as the sun slowly sets over Turnagain Arm.